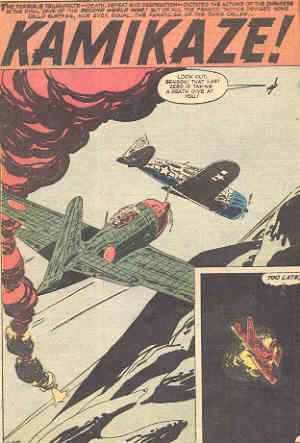 The five-page story entitled "Kamikaze!" in the April 1959 issue of the comic book Battle has almost no connection with real history. Kamikaze, described as the "most fanatical war tactic ever devised," refers in the story to Japanese Zero fighter pilots making suicidal ramming attacks on American Hellcat fighters in the air and later on the ground. However, the Japanese military never made such systematic ramming attacks with Zero fighters, although from time to time a pilot individually decided to make a ramming attack after being hit. Also, the Japanese Army did have special attack squadrons that made ramming attacks against B-29 bombers that flew over the Japanese mainland. A reference to kamikaze attacks on American ships dates this story sometime after the first kamikaze attacks in the Philippines in October 1944, but the comic mentions no specific date. The yellowish-skinned Japanese Navy leaders unrealistically dream of starting another victory march across the Pacific when they invade the mythical Kaba Atoll  after destroying all of the American planes in the area with kamikaze attacks. These fictional Japanese leaders make obviously ridiculous strategic moves. All Japanese Zeros have orders to make suicidal ramming attacks on American fighters despite in real history being vastly outnumbered. When the Americans stop flying for two days, the Japanese Colonel in charge gets impatient and sends five Zeros diving into an American airfield to crash into planes parked there. The success of this attack leads the Colonel to send the next day all of the kamikaze planes against remaining aircraft parked at the airfield. Surprise, surprise, the aircraft turn out to be decoys, and the real Hellcat fighters had been hidden in the jungle. When the remnants of the Japanese fleet appear in open waters, the Hellcats suddenly attack and destroy the ships. This issue of Battle contains four other comic stories with each one taking place in a different war: Civil War, WWI, WWII, and Korean War. Like "Kamikaze," these other four stories do not make any attempt to provide accurate historical background. Battle comic book was published from March 1951 to June 1960. Although "Kamikaze!" portrays ridiculous history, the comic opens with an insightful phrase regarding the reasons why Japan turned to kamikaze attacks: "death, defeat and desperation." 1. The spelling of this non-existent atoll is inconsistent in the story. Two places spell the place as Kaba Atoll, but another place uses Kabe Atoll.